Bird feeder Suet Cakes for cage Suet Bird Feeders are special Non-melt, No mess all year round suet. 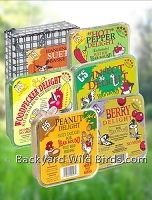 Wild bird 2 favorite kinds of bird suet cakes: Peanut Suet Delight and Woodpecker Suet Delight. 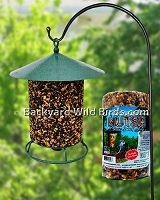 Suet bird feeders can come with simple cages for all birds, large cages just for songbirds or suet enclosures for large birds like Woodpeckers. Bird Suet Cakes for cage Suet Bird Feeder has no melt Suet Delight wild bird food with 5 each of these best selling Suet Cakes. 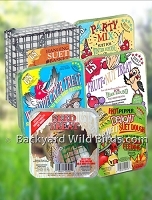 Bird Suet Treat Cakes and Suet Feeder is 5 Suet Treat Suet Cakes sampler plus hanging suet cage, it has what birds like! 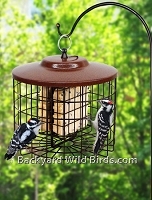 Cedar Suet Sunflower Bird Feeder is a heavy duty western red cedar feeder. The hopper feeder has a perforated bottom for good drainage. It feeds peanuts in shell or suet on its two end cages and holds 10 cups of different types of seed in the hopper. Copper Seed Log Bird Feeder is a feeder with one large seed log. The included Bird Seed log has sunflower seeds and mixed nuts to put in its wire cage holder. 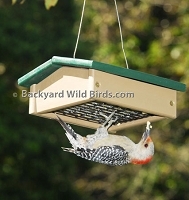 The seed log or suet ball feeder is great to hang and attract Woodpeckers with their own special seed. 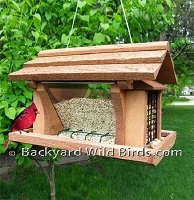 Seed Log Bird Feeder is a feeder with one large seed log. The included 40 oz. 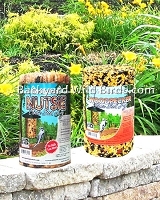 Nutsie Bird Seed log has sunflower seeds and mixed nuts to put in its holder. Bird Seed Logs are two 40 oz. bird seed logs. There is a Woodpecker seed log and a Nutsie Seed Log. Seed logs are an ideal way to offer your birds a high-energy supplement good for year round feeding. 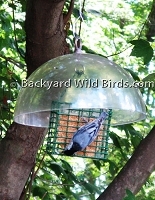 Suet bird feeder with clear 12" dome baffle that protects it from the weather and squirrels. 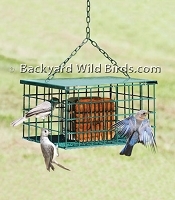 Includes a favorite peanut suet cake for the suet feeder.